This BMW is the latest vehicle caught on camera as part of Peterborough's #Dashcamscheme. Launched last year by a group of 35 Peterborough driving instructors in an effort to raise driving standards in the county, the scheme looks to raise awareness of driving habits in the city and highlight vehicles caught on camera acting erratically. 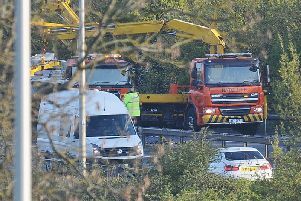 This latest video, sent in to the Peterborough Telegraph by Laura Neilson, was captured by the Eye Roundabout, where Frank Perkins Parkway meets the A15. The dash cam footage features a silver BMW changing lanes on the roundabout and weaving its way through traffic. Ms Neilson said that in her opinion it constrituted "dangerous driving." Speaking to the Peterborough Telegraph when the dash cam scheme launched, Steve Edwards, one of its leaders, said: “The reaction from both driving instructors and the public has been good. Driving standards in Peterborough are terrible, but we are already noticing differences. “Last week a car came right up to the bumper, driving terribly. But when their passenger pointed out the sign on the back, they backed off, and drove sensibly. A spokesperson for Cambridgeshire police said: “Dash cam footage can be a useful piece of evidence when investigating serious collisions. However, the footage is only one element of an investigation and does not always meet the evidential criteria for prosecution. “When considering the process of reviewing large volumes of dash cam footage we have to consider the resource that is available to us, as well as the likelihood of prosecution. “Our priorities are focused on protecting the vulnerable, which include areas such as domestic abuse, sexual assaults and child abuse.